The joy was tempered soon after, though. 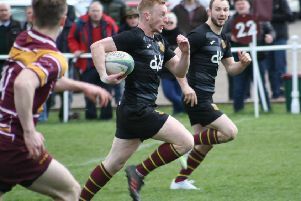 with the news that Hullensians, whom they had been battling with to avoid relegation, had won with a try in the last minute at home to Selby to seal the Copley men’s fate. He outlined the lack of bonus points, a horrendous injury list and unavailabilities as being major factors in the club’s league position. Survival in Yorkshire One could still happen though if Heath win their play-off match at West Hartlepool on April 27. The victory over champions Moortown had never looked likely as Rishworthians were hit again with players, notably from the backs, unavailable and were forced to play two flankers in the three-quarters. It looked more unlikely as the visitors scored a converted try with their first attack of the game, and even more so when Rishworthians were reduced to 13 players in the middle of the second half. But there was grit and determination from the home side as they calmly and intelligently went about their business, showing plenty of skill and game management, preventing the visitors getting their game together. They scored first with a Josh Kelly penalty, gained after a brilliant burst down the wing by Jacob Bower, who had another outstanding game playing out of his normal flanker position. Moortown hit straight back with a try and then put Rishworthians under extreme pressure for several minutes. Good defence meant they were restricted to a penalty. Kelly reduced the arrears with a penalty before the visitors turned the screw again and scored a second converted try to lead 17-6. It heralded a purple patch from the home side. Stone and Bower both went close before the ball was switched wide to the other side and a deliberate knock-on to prevent a successful last pass brought a penalty try. The two flankers in the backs, Bower and Harvey Keighley-Payne, combined well in a move which was completed when replacement back rower, Rishworthians’ man of the match Nick Faulkner, burst through with a strong run to score. Kelly converted. They almost added to their score with the last move of the half. Another strong burst from Faulkner ended with skipper Fraser Swarbrooke being forced into touch on the corner flag, but they still went in leading 20-17. The second half opened with Rishworthians on the attack and preventing Moortown from playing. Every attempt to break out was met with excellent tackling. A penalty put them near the visitors’ line. The forwards drove it on and eventually crossed the line with prop Phil Kershaw getting the touchdown. Kelly converted to stretch the lead to 10 points. Things then started to go wrong for the home side as Stone controversially received a second yellow card, which then became red, and while advantage was being played the referee took exception to a tackle by Keighley-Payne and he too saw yellow, leaving Rishworthians with 13 players for 10 minutes. They conceded a converted try but held out until Keighley-Payne returned. They then played calmly until the end, keeping the ball tight and working their way upfield with phase after phase in possession and even extended their lead with a Kelly penalty. They continued to keep it tight and run the clock down until the final whistle. Before the match there was a an under-11s curtain raiser, Rishworthians defeating Heath 7-1. The Development team went down 39-15 at Moortown with tries for the Sutcliffe brothers, Kurt (2) and Luke.